Scarcity means limitedness, which is used in the context of natural resources, that can be reproduced but still scarce as at a given point of time, the availability is limited. The shortage, on the other hand, is a market phenomenon, used for products and services which are not available in the required quantity. We all know that human wants are unlimited, and the means to satisfy human wants are scarce. In microeconomics, we study, how people work jointly to convert scarce resources into useful goods and services with the aim of satisfying the most urgent of our unlimited wants and the allocation of these goods and services among people. Scarcity is the fundamental economic problem, which is not exactly same as the shortage. 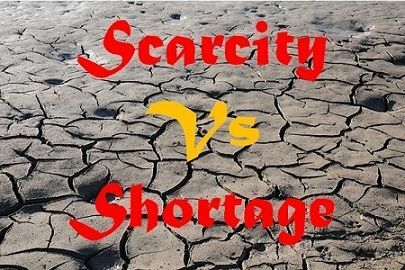 Read out the differences between scarcity and shortage in the article below. Meaning Scarcity refers to a state, when a resource is available in a finite quantity at a particular point of time. Shortage means a situation in which the offers of a product is less than the bids. Occurrence Scarcity is when something is rare and difficult to reproduce. Shortage is when an item is popular and easy to get but sometimes supply does not satisfy demand. The basic problem in the economy is that the society has inadequate productive resources to satisfy unlimited human wants and needs. Economically, the phenomenon which states that the unlimited human wants are to be fulfilled with limited resources is called scarcity. Alternately known as paucity, which implies availability of something in small quantity. Every economic activity is performed with the aim of solving the problem of scarcity. Although the problem of scarcity is critical, as the resources take the time to reproduce. So, we have to make a choice as to which want, should be satisfied first, to make the best possible use of scarce resources. By the term ‘shortage’ we mean a situation in which the supply of a particular product or service in the market is not enough to meet the quantity demanded at a particular point in time. In simple terms, when the demand for a good or service is more than its supply, is essentially what economists call shortage. Miscalculation of demand by the company. Natural calamities that causes the deficiency of necessary products. A government ban on the sale of the product. A state, when a resource is available in a finite quantity at a particular point of time, is called scarcity. Shortage implies a situation wherein the supply of a product is lower than its demand. Scarcity is when something is rare and difficult to reproduce. On the contrary, the shortage is when an item is popular and easy to get, but sometimes supply does not satisfy demand. Scarcity is ever-lasting whereas shortage is a short-term, i.e. the problem of shortage can be resolved. Scarcity is a natural phenomenon. As opposed to the shortage, which is created by market forces of demand and supply. The term scarcity is used in the context of natural resources like time, oil, land, etc. which depletes over time. Unlike shortage, that occurs for man-made goods or services. The terms scarcity and shortage are commonly misinterpreted, used synonymously indeed, but there is a fine line of differences between them. While shortage is man made, where there is the lack of goods or services in the market due to excess demand over supply. Scarcity is used to refers all resources which are limited in nature. Still, they have alternative uses. When there is a scarcity of something, it means that you don’t have raw materials to produce other useful goods. So, scarcity is a broader term than the shortage, as the latter can be resolved but the former cannot be resolved.